Yesterday, I posted my own (personally developed) recipe on royal bibingka if you missed it, you can check it our her - royal bibingka. 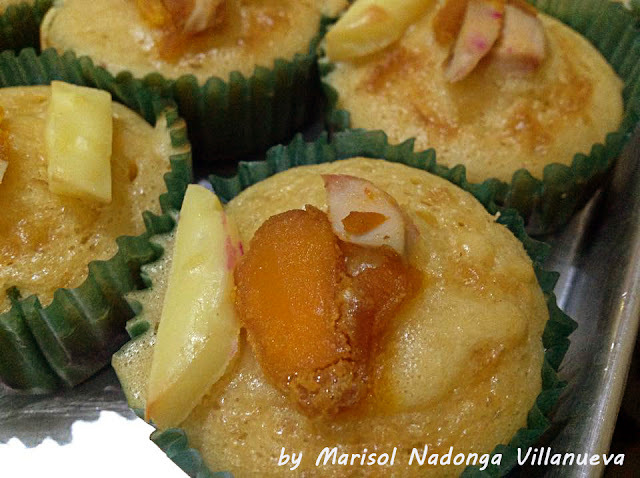 Since, "All Souls' day and All Saints' day are fast approaching, and it is part of Filipino tradition to serve traditional rice cakes (kakanin) during these occasions, here is another bibingka recipe you can try. Bibingka, are one of the many Filipino native delicacies that are made from rice flours and coconut milk. Bibingka is usually serve during special occasions like pista ng mga patay (all souls' day), holy week, Christmases, and New Year celebrations. It is almost similar to the muffins of the Western cuisine as bibingka has almost the same crumb texture as quick breads, are also chemically leavened, and are also cooked in dry heat. Bibingka, as earlier mentioned are made from rice flours and coconut milk, other ingredients includes milk and cheeses, and they are "baked" the traditional way, that is, the rice batter is placed on a bibingka molder made of clay, cooked on top and under live charcoals. With the availability of modern cooking equipment, however, bibingka are now baked inside ovens with temperatures that can easily be controlled. I never had the chance of making bibingka even to this moment. I only buy them. I love bibingka specially those topped with grated cheese and salted eggs. 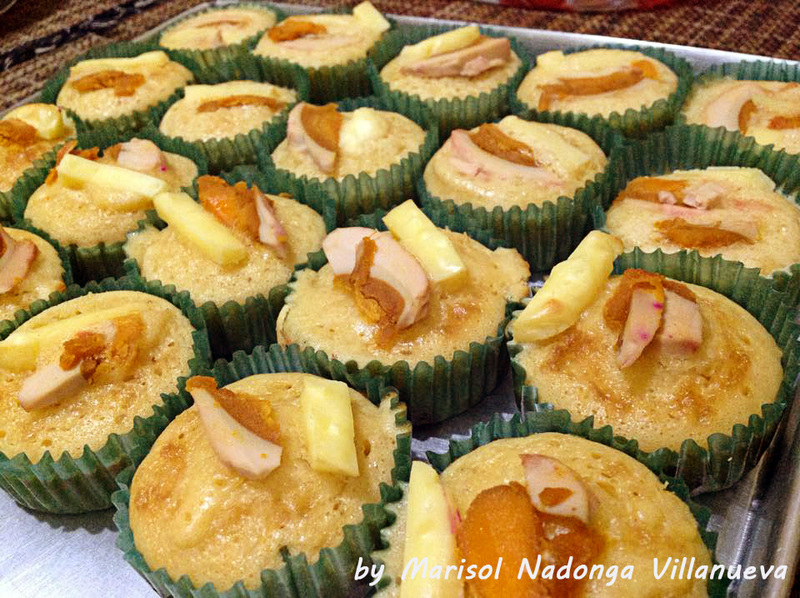 Here is a bibingka recipe generously shared to us by Ms. Marisol Nadonga Villanueva. She is currently residing in Sorsogon. 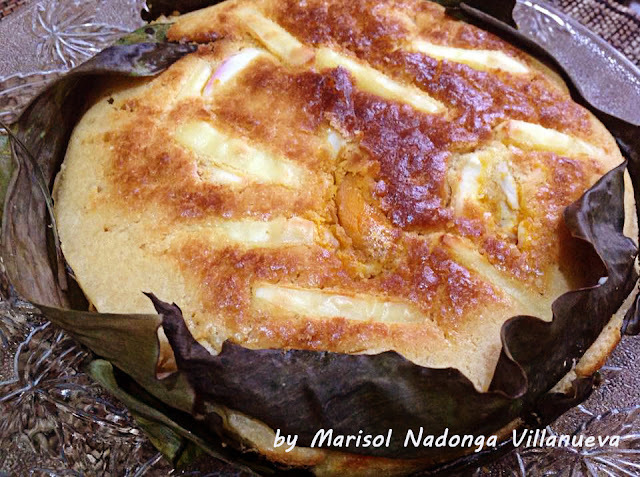 Thank you Ms. Marisol for allowing us to share your recipe and pictures of bibingka in our blog. Baking powder - 2 1/2 tsp. 2. In a bowl, combine all purpose flour, rice flour, and baking powder. 3. Mix melted butter, sugar, eggs, vanilla, evaporated milk, and coconut milk. 4. Mix dry ingredients to wet ingredients. 5. Put in muffin pan with banana leaves as liner. 6. Bake for 5 minutes at 180-200C. Remove the bibingka from the oven then top each one with salted egg and cheese and then put back in the oven and bake for another 10mins. If you are cooking the bibingka using larger cake pans, bake for 20 minutes at 180-200C. Remove the bibingka from the oven then top with salted egg and cheese and then put back in the oven and bake for another 15 to 20 mins. Before serving, brush the bibingka melted butter then sprinkle with sugar.